Chronic nerve pain increased as I trained for the biggest hike of my life. How could I expect to get to the top of a 17,000 ft mountain when the pain stopped me from training? I'm a physician myself, but if I didn't find Theta on the internet, the top of Mt. Killmanjaro would still be just a dream. With chronic foot and callous pain by age 28, I became one of Theta's early research patients. I've worn 32 degree Theta Orthotics for almost 22 years now. The callous is gone and so is the pain. If it weren't for Theta, I don't think I could last even one shift at the hospital. The new nurses call me bionic. After 5 neuromas and 3 failed surgeries, the nerve pain was back again. Skeptical but desperate, I found Theta four weeks before a 100 mile race. Unbelievably, I continued training and finished without neuroma pain. At first I thought that Theta was too good to be true! With enough trust, Theta proved to be both good and true. I was lucky to avoid neuroma surgery when I found Theta Orthotics almost 24 years ago. Now at 90 years of age I'm still active, still wear my orthotics and still pain free. I wanted a permanent health solution that worked with my life style. I got it! I've only been wearing Theta orthotics for a few months, but have used many other orthotics for chronic foot and knee pain in the past. Thanks to my 27 and 32 degree Theta's, I've experienced obvious improvement for the first time. I'm no longer considering surgical fusion for chronic Lis Franc Arthritis / pain. I started wearing Theta Orthotics in high school to stop arch pain caused by my flat feet and hours of dancing every day. For the last 3 years, I've used 27 degree Theta's and PST's when I dance. If it weren't for Theta, I wouldn't be dancing today. What should I know about Morton’s Neuroma? How can I Stop Morton’s Neuroma pain. There is a lot you need to know because this condition is relentless and overwhelming. Metatarsal bones are the five long bones in the foot. Inter-metatarsal Morton’s Neuroma of the foot is a common problem that results in swelling and inflammation of the nerves, located between the 2nd and 3rd, or 3rd and 4th metatarsals. This condition can present gradually, or very rapidly when associated with trauma.Once the pain begins, it will progress. The pain is directly related to the amount of time you spend walking and standing. The condition begins as an annoyance, later over time it become a constant disabling pain. The intense and disabling nature of the pain associated with Morton’s Neuroma eventually demands attention. Even the most stoic of patients eventually consults a physician. Unfortunately the treatment of this disabling condition eludes most physicians and surgeons and the patient is forced to gradually eliminate their activity. This condition is progressive and will continue to get worse as long as you remain activity on your feet. What are the symptoms of Morton’s Neuroma. In the early stages of Morton’s Neuroma the symptoms are primarily a numbness or wadded up sock feeling in the ball of your foot. At this point the condition is more of an annoyance than it is a real problem. Often this annoyance phase proceeds for several years before it changes to a burning pain, only after you have been on your feet too long. Eventually the burning becomes more frequent, and more intense. At this point the patient is forced to minimize weight bearing activities. Rest, elevation, medication, and physical therapy can all be somewhat helpful. The burning and shooting pain comes and goes at this stage, but over time when the condition advances becomes more constant and these same treatment have minimal benefit. Most patients begin wearing wider bigger shoes, women give up on heels, and athletes consider giving up on their favorite sports. In the end stages, generally after years of symptoms the patient reports constant disabling pain with every step. 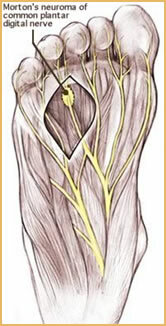 Some patients report that the nerve will throb even after they get off their feet. This Sharp shooting pain , that starts under the metatarsal region, and then radiates into the two adjacent toes, will radiate up the inside ankle in some advanced cases. The average patient that call me has had the condition for about 5 years. The longest anyone has been diagnosed, and attempted many different treatments before they call me is 45 years. Very common to hear that a patient has been looking for help, been too multiple general physicians, podiatrists, orthopedists, chiropractors, reflexologists, naturopaths for ten, twenty, or thirty years. Pain with palpation of the inflamed inter-metatarsal nerves, and a characteristic “click” with manipulation of the metatarsal bones, are all classical signs of a Morton’s Neuroma. Do I need an MRI to confirm the diagnosis of Morton’s Neuroma? MRI Computerized imaging techniques will document but are not necessary to diagnose this benign lesion of the foot. These tests have mostly research and medical legal value. For years the diagnosis of Morton’s neuroma was based on clinical findings. Although x-rays are often take to rule out fractures, they do not show the Morton’s neuroma. Fact is that only well advanced Morton’s Neuromas will show up on an MRI and you actually require some experience and skill to identify them when they become as big as the end of your small finger. The classical “click” or Mulders sign that is felt when the 2nd 3rd and 4th metatarsals are compressed was diagnostic. When performed, the patient would express EXTREEM displeasure, pull their foot away, and tell the physician not to do that again. This confirmed that you had a Morton’s Neuroma. Currently most insurance programs require an MRI before they pre-authorize surgery. Change gait and stop Morton’s Neuroma pain. What is the cause of Morton’s Neuroma? The cause of the inflammation is constant grinding on the nerve as you walk. This results in a progressive enlargement and swelling of the nerve. The breakdown of the arch, known as pronation, produces instability of the metatarsals, and finally a movement that literally grinds the inter-metatarsal nerves between the bones. Over time the inflammation and swelling around the nerve gradually increases, and collagen is deposited creating a scar tissue around the nerve fibers. This process continues as long as you remain active on your feet. It become critical that you understand what the cause is and then treat the cause if you want to stop the progression and proliferation of this condition. Clearly Morton’s Neuroma is aggravated and caused by weight bearing activity. So the cause of Morton’s Neuroma, is Pronation of the foot during weight bearing function. When should I see a doctor for pain between my metatarsals. When you see the doctor for Morton’s Neuroma is probably more of a personal choice, and what make you comfortable emotionally. Unfortunately when Morton’s Neuroma is caught early, when the condition is just an annoyance, the diagnosis is actually more difficult and less obvious. Other conditions like stress fractures, arthritis, plantar plate tears, capsulitis, tendonitis and Morton’s Neuroma are all grouped in to a common diagnosis called metatarsalgia. It really doesn’t matter if you catch this condition early or late, if you remain active the condition will worsen over time, and fail to respond to both conservative and invasive techniques. To complicate the issue further some doctors do not like to make the diagnosis of Morton’s Neuroma. Both the physician and the Insurance Companies see red flags when the diagnosis of Morton’s Neuroma is made. Can foot trauma cause Morton’s Neuroma? A significant number of patients get their first real symptoms of an acute Morton’s Neuroma, following some form of trauma to the foot. Trauma that involved a laceration of that same web space, heavy objects dropped on the top of the foot, impact from a fall, or the most common bedroom fractures (5th toe). The trauma ultimately creates swelling that spreads throughout the ball of the foot. This swelling compresses the beginnings of an asymptomatic neuroma, and can awaken it in full glory, very quickly. Most patients believe the trauma caused the neuroma, but if that were the case it would heal up as the trauma healed. In fact the trauma did not cause the neuroma but it precipitated it. It pushed it over the edge and it now was obvious and progress in spite of proper treatment. Can you get more than one Morton’s Neuroma? What conservative OTC treatments can I try for Morton’s Neuroma? Anti-inflammatory and Pain medications are often the first self treatments to be tried, and are often helpful short term in the early stages of the condition. More commonly patients self treat by first eliminating shoes with a heel. Later they purchase bigger and wider shoes, with an enlarged toe box, in an effort to minimize the compression on the inflamed neuroma. At some point most all Morton’s Neuroma patients try a metatarsal arch pad. 50 percent who try find the pad to cause more pain, the other 50 percent report it provided the only help they got. Either way the metatarsal arch pad is not enough. Many patients eventually end up wearing support sandals, like Vionics, Fit Flops, Birckenstocks. The support they provide limit a small amount of pronation, and the sandal design decreases compression. When should I consider surgery as treatment for Morton’s Neuroma? From the first time you get a sharp burning pain, you are considering invasive procedures in an effort to get it out. Many patients these days are opposed to surgery, but even they eventually consent as the pain progresses in intensity and frequency. Unfortunately none of the conservative treatments work and neither do cortisone injections which are always temporary. Alcohol injections in an effort to ablate the nerve have no documented benefits and have many potential complications. Cryo-ablation, Radio-Frequency ablation, and surgical ablation all attempt to kill or ablate the nerve. Some techniques more consistently kill the desired nerve and produce a preferred resolution to the painful symptoms. The problem is that the same forces that caused the neuroma in the first place are still present. The complications of stump neuromas, re-growth neuromas, and most frequently new neuromas is VERY high. Even when the surgery goes perfectly, long term the treatment fails as the patients just grows more neuromas. Is there a successful long term treatment for Morton’s Neuroma. Theta progressively changes the way you walk until your pain stops. Without constant irritation every step you take, the swelling subsides and your pain goes away. Because theta progressively changes foot function to levels far beyond what other foot control devices can do, Theta will keep you active and stop the pain, when all other treatments, orthotics, and even surgery have failed. When you are ready to stop suffering, it is time to accept the only long term successful treatment for Morton’s Neuroma. How can I avoid surgery for Morton’s Neuroma. After 35 years of treating Morton’s Neuroma, I have only found one way to stop the progression of this disabling condition. Actually two ways if you count eliminating most all weight bearing activity from your life. That would make you a couch potato, which is just the opposite type of person that normally gets this life changing condition. Every patient that calls me for help tells me that the pain is running their life. Although many of these conservative treatments will help temporarily in the early stages of the condition, none of them will work well enough to stop the progression of the condition. Eventually every Morton’s Neuroma patient has to consider surgery as their last option. So basically you either eliminate most weight bearing activities or you find a way to change what is happening when you walk, run, and stand. If you want help but you don’t want surgery, Call 801651-3067 and stop the pain. Will Theta Orthotics help patients avoid surgery? Can Theta Orthotics help patients who have already tried surgery and failed? Check out these videos from a few of our long term Theta Orthotics patients. Most of the patients who call me are looking for a treatment that will help them avoid surgery for Morton’s Neuroma. Hear what they have to say about Theta Orthotics.